This is the earliest work in the show, in more ways than one. When I saw this photograph in the collection of Minnesota Museum of American Art, I knew that despite its gaseous aspect it meant something solid. It signified that my intuition about the collection, my inkling that I would be finding work of merit, was correct. It became the first photograph in Framing the Field, before I had the title, before I even knew what the show was going to be about. It was the buoy, the photograph that enabled the rest of the work now hanging in the C. G. Murphy Gallery to rise to the surface and become visible as I scanned the ranks and files of images in the museum’s collection over the last year in preparation for the show. Organizing a show like this is like three-dimensional chess (remember Star Trek?) plus a fourth dimension, which is knowledge of axes x, y, and z over time. In this photograph I see hard facts become myths, and myths dissolving. 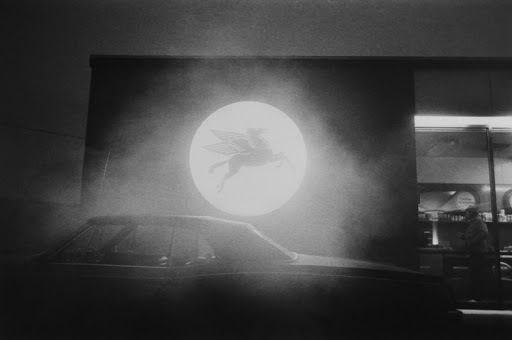 I see a backlit corporate emblem, not quite so recognizable anymore, become a full moon and a backdrop for a misty, mystical winged horse, the spirit of American mobility leaping out of a driver-less convertible. I re-experience cool nights at way stations between somewhere and somewhere else, and the casual, transient comfort of the well-lit counter inside. A chill comes over me again as I imagine the gasoline crises that would set in within a year or two, signaling the beginning of the end of the freeway free-for-all, the automotive imperialism that so many Americans still cherish as a national birthright. My knowledge of Elaine Mayes and her work predated my engagement to curate a new photography exhibition from the MMAA’s permanent collection. I knew that she had spent time in Minnesota, teaching at the University of Minnesota with Jerry Liebling in the late 1960s. I remembered a couple of gorgeous, open-hearted portraits of Haight-Ashbury residents that she made circa 1967, shortly before coming to Minnesota; Ted Hartwell acquired these for the Minneapolis Institute of Arts and published them in his book, The Making of a Collection (Aperture, 1985). And I knew that this photograph, made on I-87, the New York State Thruway, in the early 1970s, was part of a show I’d seen earlier at MMAA, not long after it was acquired in 1990 as part of a portfolio titled American Roads. It was a fortunate acquisition, as far as Framing the Field is concerned; also included were prints by Joel Sternfeld and Steve Fitch that are in the new show. That’s one thing a curator does—shuffles the deck and lays out a new hand. Faces up. Then rearranges, discovering which pictures are most compelling. Here’s one. I knew/know nothing of Elaine until I saw the show last week. Of everything in the show, this is the one image that burned itself into my delighted brain. Wow.